Uncut out-takes from UK-produced video made in the 1990s based around the Museum of Synthesizer Technology. For real die-hards only. 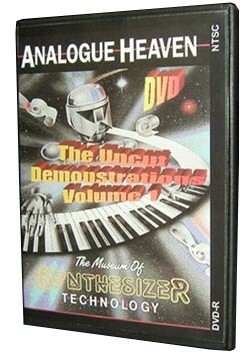 This DVD features full-length, blooper-and-all demonstrations from a celebrity list of players putting a variety of vintage synths through their paces on the opening day of the UK's Museum Of Synthesizer Technology. If you're turned on by simply listening to people play and talk about Mellotron (Bob Moog, & Steve Hackett amongst others), ARP2600, Synthi 100, and Bob Moog himself on the modular Moogs, then get out the popcorn and sodas.